Prayer underpins ALMA. 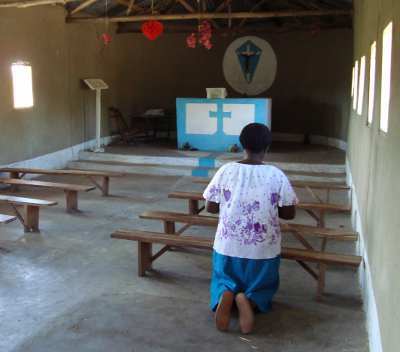 Some churches like to pray for their linked parish on a fixed Sunday each month. Beryl Warren, ALMA’s Intercessory Chaplin, reflect on the importance of prayer in ALMA and shares how everyone in ALMA is held in prayer. I believe in the power of prayer and that God always hears every single prayer and responds. For me, prayer deepens and sweetens my relationship with Our Lord and it is a way of identifying with Jesus Christ. A very important reason for me to pray is that it gives me another way of expressing my gratitude for the love God gives to me and to all of us. I have been given a great deal through my connection with ALMA, for which I will always be thankful. Even before I visited Tete, our twinned parish in Mozambique, I had seen a video showing the work that ALMA was supporting in Mozambique and Angola. I just fell in love with the people. When we actually made our visit to Tete, the depth of spirituality in the people we met fed me spiritually in such a way that it opened up and broadened my own spiritual awareness which taught me so much. I have lists of people connected through ALMA and I pray for ALMA twice a day, but I do not pray for just a name, I pray for the person or place behind that name, so I can feel just as much a connecting love with someone I have not met or a place I have not been as with someone I do know or a place I have been. I believe this is a grace given to me by God. I probably know heaps of people in ALMA, I just have not met then all yet but, by praying for them, a relationship already lives, through God. The Partnership Prayer written by Bishop Dinis is a prayer of commitment. Alongside this is the everyday discipline of intercession, personal and collective.